Sunday, December 8, 2013, 4 p.m.
Antonio Sacre. Cuban-Irish-American teller and solo performer, who twice won “Best Storyteller” at United Solo Festival NYC, and twice won “Best-In-Fringe Festival Award” at the New York International Fringe Theater Festival, He is not a character actor nor a comedian but someone with a perpetual story and an extraordinary talent for engaging an audience. Therefore, he is frankly funny, uncompromisingly believable, and above all – kind. (Backstage) He tells La Noche Buena, a Cuban Christmas. Michael D. McCarty. Some of life’s funkiest experiences make some of the best stories. McCarty has had a funk-filled life and shares his stories with intensity, humor and goo gobs of enthusiasm. His motto is, “Have Mouth. Will Run It!” He tells What the Hell Does He Know About Silence? Xaque Gruber. Xaque (pronounced “Zack”) Gruber’s written for film, TV, magazines, and is a regular contributor to The Huffington Post. When Xaque’s hands aren’t writing, sometimes they are painting. His fine art has shown in galleries from Maine to the British Virgin Islands. Through the 1990s, Xaque taught art in New England to thousands of schoolchildren. In 1999, he was nominated for Massachusetts Art Teacher Of The Year. He tells Handjobs from his hand modeling experiences. Gisele Nett. (The alter ego of actress Jonna Tamases) is a button maker from Hamburg, Germany. A kooky optimist, a clown-nouveau, an adorable new voice in storytelling. She tells If Monks Can Do It, So Can I.
Carol Schlanger. 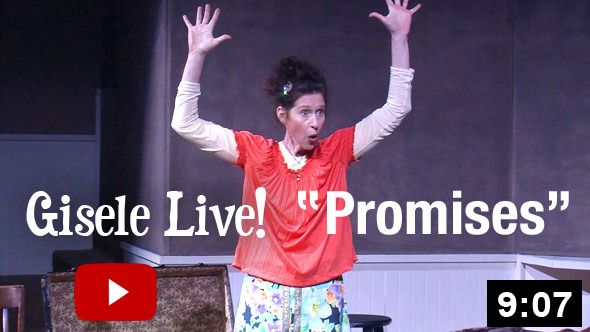 An award-winning playwright, actress, storyteller, and performer with a darkly comic and cutting edge vision. She is an Obie (Off-Broadway) and Humanitas (Television) nominee, a recipient of a Los Angeles Dramalogue Critics’ award for performance and writing (Theatre) and placed first in the 2010 Alliance Of Los Angeles Playwrights’ monologue slam. Susan Tierney. An actress who comes from New York City, she writes and tells stories around town. Latest places include: Story Salon, Sit ‘n Spin, Spark Off Rose, In Bloom, Greatest Storyteller In Long Beach. She tells Snow. Jonathan Leigh Solomon. He began his career as a New York-based comic, making regular appearances on the Late Show with David Letterman. Moving to Hollywood he was a staff writer on Emmy winning sitcoms. He writes humorous essays for the Huffington Post and Politico.Com and can be heard blabbering humorously on NPR, Sean Hannity and podcasts from one end of iTunes to the other. He tells Fill The Silence, a ”cute meet” leads to confronting old age. Shelly Goldstein. A writer, director, and performer who has written for every genre of TV, film and stage. She has performed her one-woman shows throughout the US and the UK and co-starred in the British film The Riddle and the Irish film Assault of Darkness. She tells Family Valued.